This seems to easily explain the phenomena in Ottawa but both the Canadian military and the US Embassy categorically denied any involvement using this new technology of radio signal jamming. It seems the mystery signal that affected Ottawa garage doors for 10 days defied all explanation until it suddenly vanished as quickly as it appeared. Industry Canada inspectors arrived in Ottawa to study the signal jamming but as they began to investigate the problem it disappeared and all systems returned to normal. No organization has claimed responsibility and it continues to defy alternative explanation. 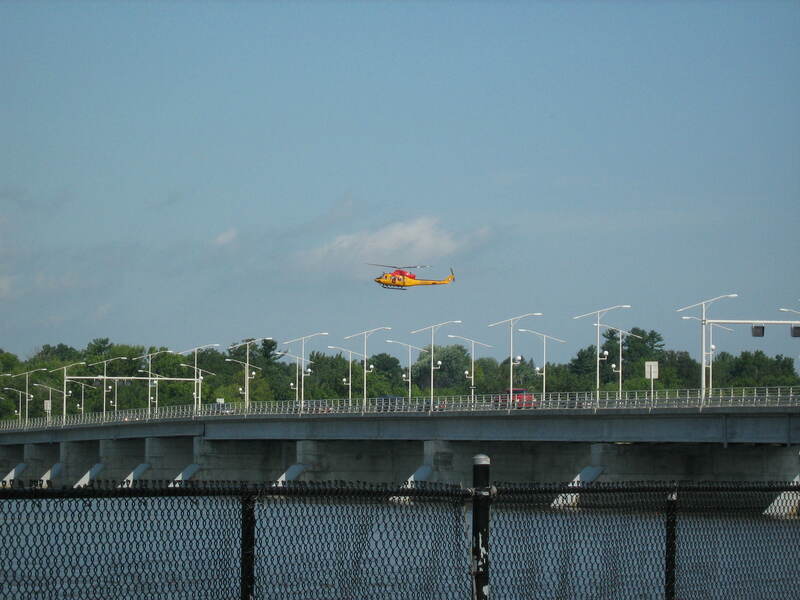 I recall in July of 2009 a number of military helicopters were circling near the Ottawa River at the Champlain Bridge and in typical Spielbergian fashion, I grabbed my bike and hastily pedaled my way down to the river to see what all the commotion was about. Search and rescue helicopters and military vehicles as well as city police equipment had gathered around the river in what looked like a complex recovery operation. 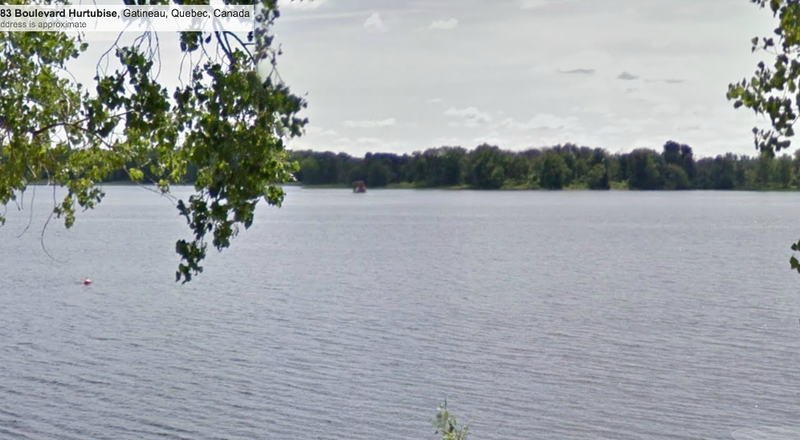 Further investigation revealed that the previous night people in Ottawa and in Gatineau reported they saw an object streak across the night sky and crash into the Ottawa River with a “thunderous boom.” The object reportedly had lights on it and appeared to change course several times before it hit the water. Soon police remarked that due to a strong current in the river and because no aircraft were reported missing, there was no debris or oil slick the search was to be terminated. No known further investigation into what happened in the river that July night has been reported and the incident remains a mystery. 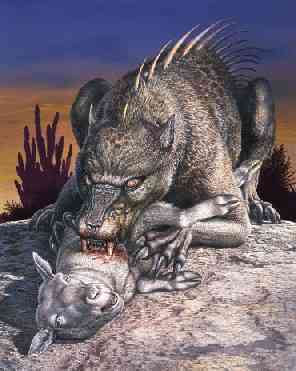 The legend of the chupacabra states the beast preys viciously on livestock. So what attacked the horse with such severity? A nearby farmer reported a cougar was spotted in his barn, but that animal had been ruled out as the attacker. The traps never caught anything and the area was soon re-opened. Speculation ranged from a bear, rabid dog, a fisher and even the legendary “chupacabra”, an odd beast rumoured to inhabit parts of the Americas. The name comes from the animal’s reported habit of attacking and drinking the blood of livestock. Described as a heavy creature, the size of a small bear with a row of spines reaching from the neck to the base of the tail. Eyewitness sightings have been been reported as far north as Maine but most experts say they are simply coyotes infected with a parasite whose symptoms would explain most of the features of the chupacabra. The attack and the perplexing case of the Barrhaven Beast remains unsolved. During the 1950s reports of Unidentified Flying Objects grew each day with both the general public and government agencies from around the world quickly reacting. Canada was not without its own concerns over these new “alien spacecraft” roaming the skies, and set up a special investigation unit in Ottawa under the name “PROJECT MAGNET”. An UNIDENTIFIED FLYING OBJECT (UFO) study program was established by the CANADIAN DEPARTMENT OF TRANSPORT (DOT) on December 2, 1950, under the direction of Wilbert B. Smith, senior radio engineer for the DOT’s Broadcast and Measurements Section. Smith, the Defence Research Board and the National Research Council (NRC) were trying to determine that if UFOs did really exist, they might hold the key to a new source of power using the Earth’s magnetic filed as a source of propulsion for their vehicles. The top secret project in Ottawa also worked with their American counterparts in the CIA to determine if this new UFO “power source” could be studied and harnessed. 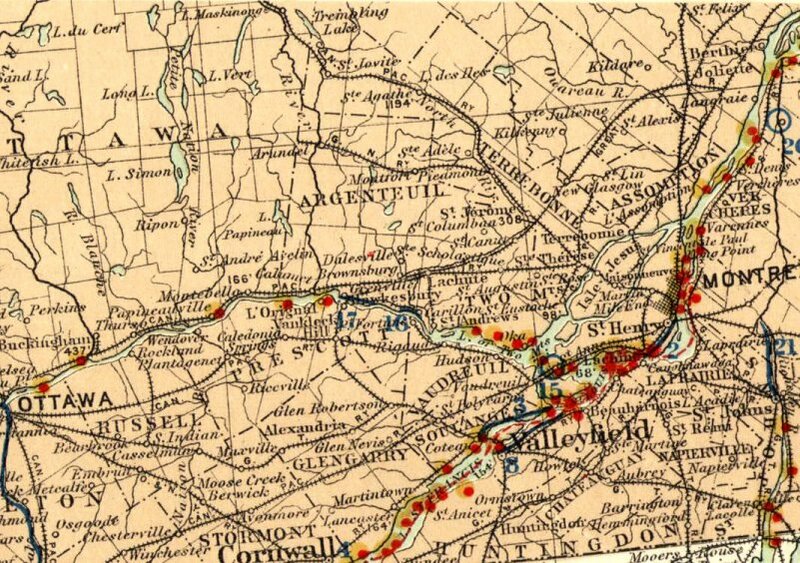 Smith’s geo-magnetic studies grew, and in 1952 the investigation was moved to Shirley’s Bay, a government facility on the Ottawa River approximately 15km west of Ottawa. UFO detection equipment was installed and by the end of October of 1952 the installation was complete. It became the world’s first UFO research facility. The 12 foot by 12 foot building housed instruments such as a gamma-ray counter, a magnetometer, a radio receiver (to detect the presence of radio noise) and a recording gravimeter within a 50 mile radius from the station. Smith and his UFO research team at Shirley’s Bay conducted a number of experiments trying to attract UFOs to the area using their newly installed equipment. After months of potential UFO activity being recorded in the area, the facility soon had their most unusual occurrence. At 3:01pm on August 8, 1954 the instrumentation at the Shirley’s Bay installation registered an unusual disturbance. In Smith’s words “the gravimeter went wild”, as a much greater deflection was registered than could be explained by conventional interference such as a passing aircraft. Smith and his colleagues rushed outside their research building at Shirley’s Bay to view the craft that was creating such a enormous reading on their equipment. Once outside the building they were disappointed to find a heavily overcast sky with limited visibility. Whatever kind of craft that was up there was well hidden under the cover of clouds. 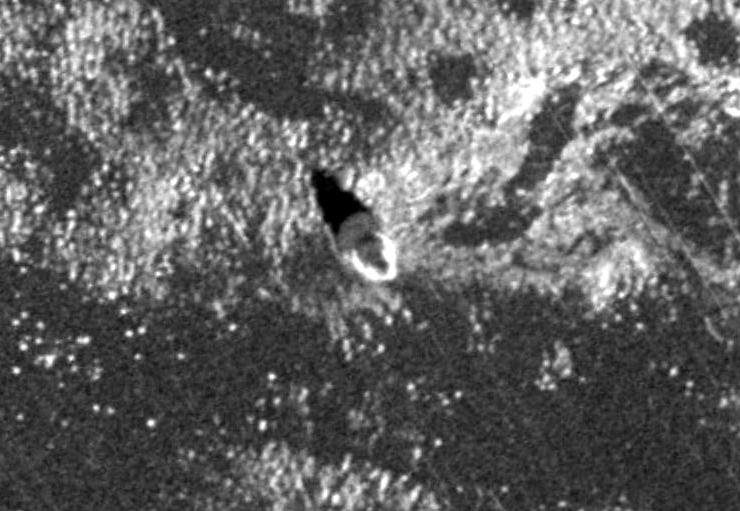 The only evidence the researchers had of this large UFO was the deflection registered on the chart recorder paper. Local newspaper article relating the 1954 UFO event at the Ottawa facility. Wilbert Smith, who headed the Ottawa UFO research lab was stricken with cancer and died before he could complete his studies. As Smith was about to finish work on this anti-gravity device he was stricken with cancer and died at the age of 52 on December 27 1962. The research facility at Shirley’s Bay was closed. The Project Magnet building he worked in existed until 2011 at the Shirley’s Bay Department of National Defence complex now known as “Defence Research and Development Canada” off Carling Avenue. It was simply marked as Building 67 but has since been demolished. Odd events occur in many communities, usually later explained through logical explanation; a mysterious light becomes a plane, a loud sound turns out to be an icequake and so on. 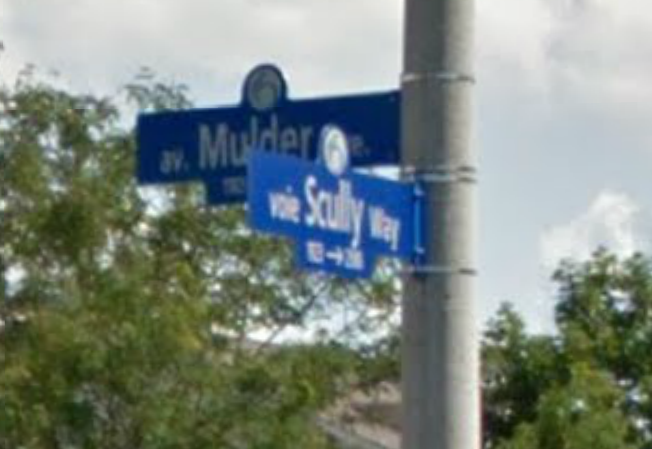 Yet there are some events that defy explanation, and Ottawa is no exception to being host to some of these interesting “X-files”. Perhaps it is because our city is the Nation’s Capital and the frequency of these unexplained events lends itself to being a perplexing anomaly. Or maybe the truth is here. 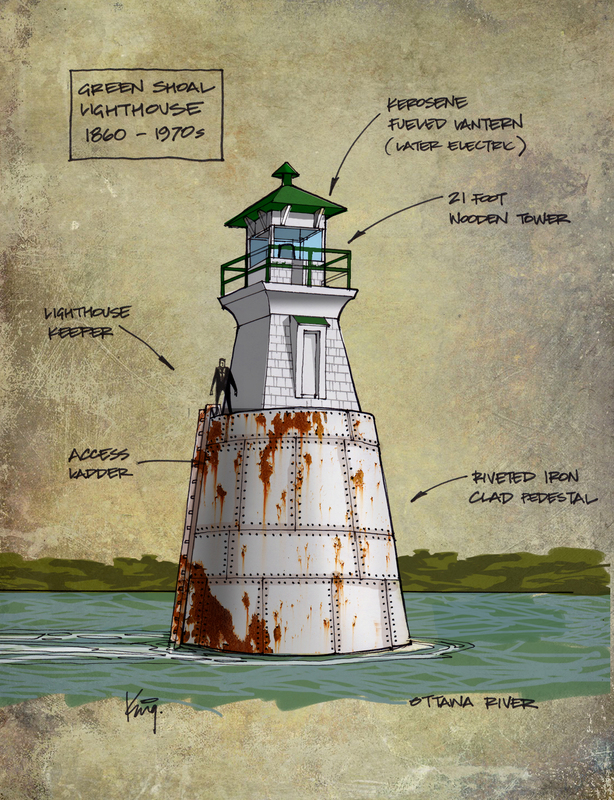 A concept sketch of how the lighthouse in the Ottawa River may have looked based on a photo taken by Lou Bouchard and aerial images from the 1960s. 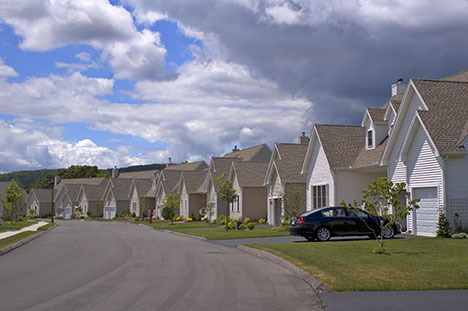 The east-Ottawa community of Beacon Hill has a history of celebrity upbringing since the early 1970s when the suburban neighbourhood was originally developed. Tom Cruise, then known as Thomas Mapother, lived in Beacon Hill in the early 1970s along with another Hollywood Tom, the home-grown comedian Tom Green. Bryan Adams and former Saturday Night Live cast member and Weekend Update anchor Norm MacDonald also spent their youth in this east end suburb located a few kilometers downstream from the Nation’s Capital. Having attracted a number of celebrities, the area also has a history of keeping people away from its shores with the construction of a warning beacon, the very beacon that gave the community its name. 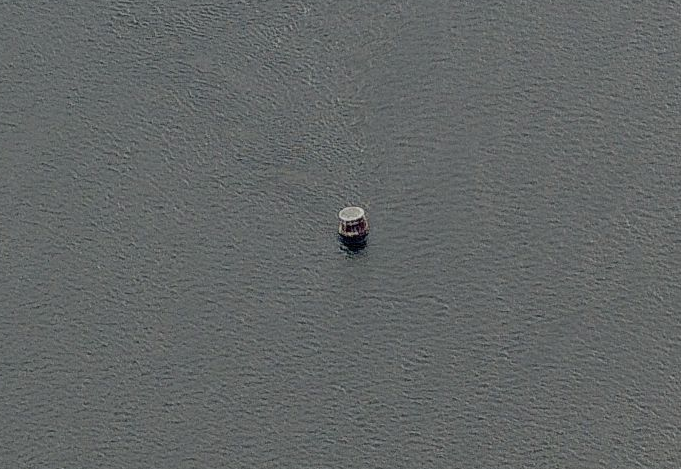 A few hundred metres north of the shore near Beacon Hill lie the remains of one of the Ottawa River’s lost lighthouses. Constructed in 1860 between the gaps of the the Ducks Islands near the provincial border, the lighthouse structure was built as a navigational aid to warn sailors of the dangerous reef of rocks known as “Green Shoal”. Navigating ships on the Ottawa River was a relatively new adventure in the mid-19th century, but with the construction of the Rideau Canal in 1832 and the Carillon Canal in 1833, the Ottawa River became a busy shipping and tourist route between Ottawa, Lake Ontario and Montreal before the advent of area rail travel. The waterway was busy with steamships plying the waves between cities, but a number of shoals and islands created hazards for the vessels and required the need for warning lights to mark their location. 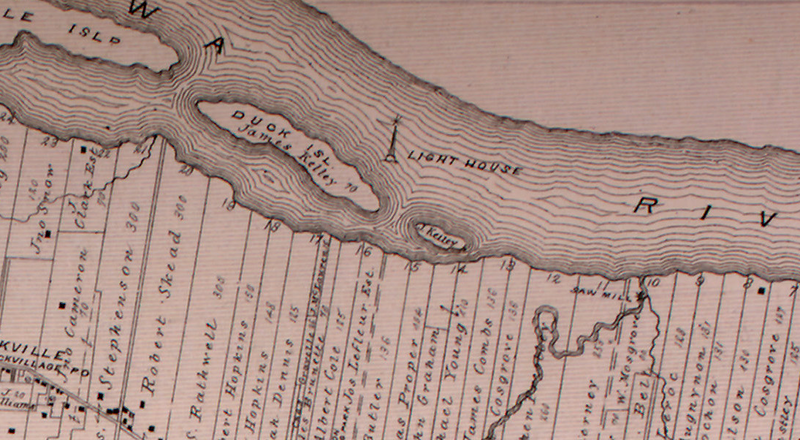 The government at the time gave the order for the construction of approximately 30 lighthouses on the Ottawa River to assist in the safe passage of growing river traffic. Pre-Confederation Canadian lighthouses were usually built of stone or brick, but with the need to build so many new structures in time, the newly formed Department of Marine and Fisheries required cheaper and faster lighthouse construction techniques. Built as four sided tapering wooden clapboard towers, these structures had the advantage of being cheap to build, and in some cases could be relocated if the site needed attention. The water hazard known as Green Shoal would seen see the construction of such a beacon structure in 1860 on a conical pedestal sheathed in iron boiler plates, riveted together like some kind of Jules Verne rocket to withstand the strong river current and sheets of crushing ice carried downstream. Atop this iron clad pedestal was placed a 4 sided white wooden pyramidal tower 21 feet in height. Using a standard design used for many of the Ottawa River lighthouses, the structure housed a fixed light that was initially fueled by Kerosene, a fuel invented by the Canadian geologist Abraham Gesner in 1846. The Green Shoal light was visible to passing ships from a distance of nine miles and eventually was rebuilt in 1900 when it was most likely converted to using an electric lamp. In 1862 the Sessional Papers of the Province of Canada reveal a house was requested to be built for the keeper of the lighthouse, yet its location or fate is unknown. In 1891 the lighthouse keeper by the name of A. Laberge earned an annual salary of $250 for his duties maintaining the light at Green Shoal. The beacon remained in operation for more than a hundred years, being dismantled and replaced by an automated light marker sometime in the 1970s. It was at this time that a new suburb was being developed nearby, and from atop the hill on what is now Naskapi Drive, the neighbourhood got its name from the old beacon that was visible on the river below. 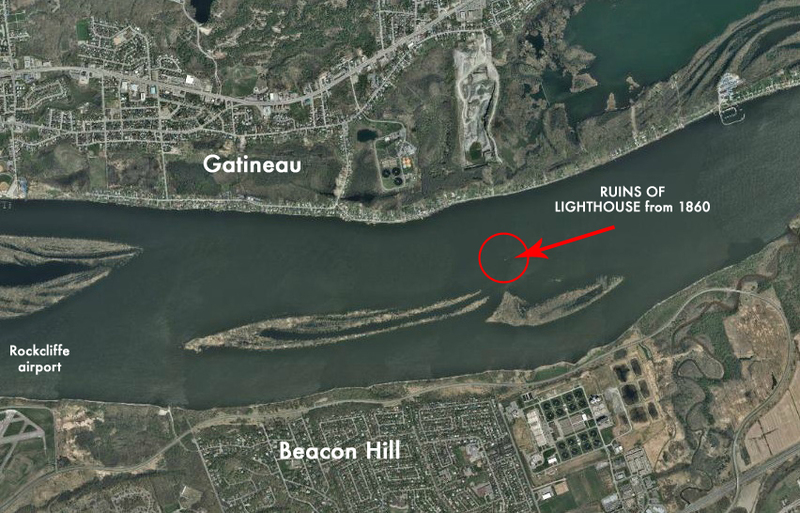 Today Beacon Hill residents and those on the Quebec side of the river can catch a glimpse of the iron-clad lighthouse ruins sitting in the Ottawa River. Bashed by years of crushing river ice, the rusty remnants now list to one side, a forgotten sentinel literally frozen in time during the winter months. 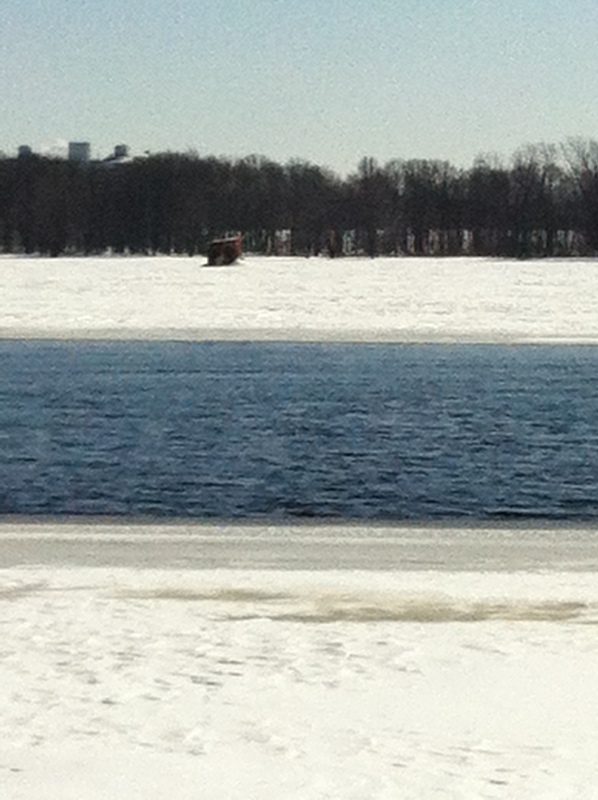 The rusting beacon ruins, literally frozen in time, encased in ice on the Ottawa River. The neighbourhood of Beacon Hill, which got its name from this very lighthouse, is in the background. Beacon Hill, a neighbourhood that could also be called “Celebrity Hill”, continues to carry the name of the structure that once warned sailors to keep away. What’s left of this namesake slowly slips under the waves from where it emerged.